Our whole food meal replacement, MRE is now available in lower calories. In the military, M.R.E. stands for Meals Ready to Eat, these meal packs are given to soldiers out in the field for fuel during intense combat situations. We built upon that concept and offer to you a delicious tasting whole food meal replacement packed full of healthy food choices that will replenish your system when you need it the most. 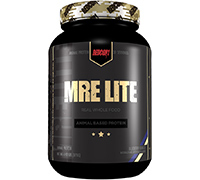 MRE Lite will deliver the same great taste and excellent source of whole foods as our original MRE formula, but with much lower carbohydrates for the person keeping a close and watchful on his or her macronutrients. That means if you’re dieting and on restricted calories, you too, can enjoy the wonders that MRE can do for your physique. 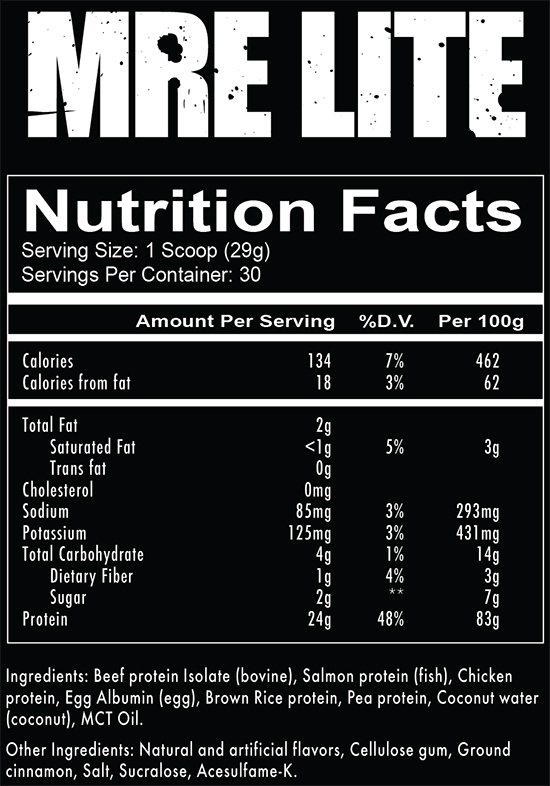 MRE Lite contains no whey protein allowing for easy digestion. Instead, you’ll get beef, salmon, egg, and chicken protein. Plus, the healthy benefits of brown rice protein, pea protein, and MCT oil. Each serving is just 134 calories with 24g of protein and just 2g of sugar.